(MP148). Charles Dixon RI (1872-1934). Watercolour. Signed and annotated "HMS INDEFATIGABLE, Guard Ship, Cowes, Aug 1912. Standard size: 13 x 8.75 ins (33 x 22 cms) approx but will easily enlarge. This was the sort of Guard Ship that the Cowes Week Committee of the Royal Yacht Squadron had in mind! One of the newest ships in the fleet and the name ship of the second class of battle cruisers to join the Royal Navy, HMS INDEFATIGABLE (Captain Arthur Leveson RN) had commissioned only 18 months before in February 1911, and so was a wonderful catch for Cowes Week of August 1912. Followed into service by NEW ZEALAND (November 1912) and AUSTRALIA (June 1913) the Indefatigables were widely reported to be more powerful even than their predecessors, the Invincibles who had entered service in the preceding few years. But the armour protection of the newer class, too, was not adequate for the sort of risks to which they were to be exposed in the war that was only 2 years away and “INDEFAT” famously met her end on 31st May 1916 at Jutland when, under heavy German fire, a magazine exploded, she broke her back, rolled over and blew up. In happier times, though, we see her lying peacefully off the starboard beam of the Royal Yacht VICTORIA & ALBERT. Court flags on the latter indicate that the King, George V, is embarked and no doubt spending much of his time racing his beloved yacht BRITANNIA. And as well as two further royal yachts lying astern of INDEFAT we see glimpses of almost every other type of craft that populated the waters of Cowes Roads during this impossibly busy period of the Season. 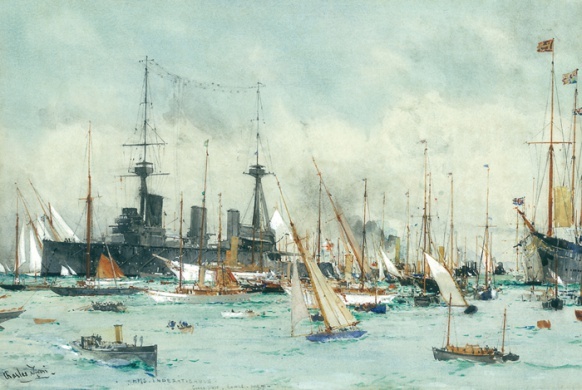 Charles Dixon painted many a picture of Cowes Week, his fondness for detail being perfectly matched to the scene though often, as here, numbers of craft were exaggerated perhaps simply to emphasise the sheer organised bedlam that obtained! A quite beautifully executed watercolour - crisp, bright and very lively.